Kaiser Permanente is an integrated managed care consortium, based out of Oakland, California, US. Kaiser Permanente is made up of three distinct but interdependent groups of entities: the Kaiser Foundation Health Plan, Inc. (KFHP) and its regional operating subsidiaries; Kaiser Foundation Hospitals; and the regional Permanente Medical Groups. The company has has 9.6 million health plan members, 177,445 employees, 17,791 physicians, 49,778 nurses, 38 medical centers, and 620 medical offices across the world as on date. The founders Henry J. Kaiser and physician Sidney Garfield started the foundation in the year 1945 and it's been 71 years they are serving the society with concern and care. Kaiser has it's corporate headquarters at Ordway Building, Oakland, California. Mr. Bernard J. Tyson, the CEO of the Health Plan and Hospitals, takes special care and strongly emphasised towards their clients. Also they extend their support with 24 hours a day, 7 days a week. complaints still do happen on occasion. Kaiser Foundation Health Plan and Kaiser Foundation Hospitals entities has a total worth of $3.1 billion together in net income excluding other revenues. Other than the mainstream health care concerns Kaiser Foundation Health Plans (KFHP) work with employers and employees and individual members to offer prepaid health insurance plans. In addition to it Kaiser Foundation Hospitals also operates medical centres in California, Oregaon and Hawaii. They also provide infrastructure and facilities that benefit the for-profit medical groups. I appreciate the fact that you now want to fill prescription(s), that have been ordered ahead of time, after you check in; and that would be fine if the area outside the pharmacy area was more sound proof. With people talking, kids yelling and/or screaming, The people in the snack area grinding coffee beans makes it hard to hear the one speaker in the open area outside the pharmacy area. It would be great if this small area outside the pharmacy area could somehow be enclosed from the rest of the open area to lessen the noise. I waited over 20 minutes at the Sleepy Hollow pharmacy for my prescription to be filled and was never called. If I was it was because of all the other noise going on that I missed it. I finally went back in to a window to get my prescription. The pharmacies at both San Leandro and Union City are both enclosed. I go to Sleepy Hollow because I live in Hayward close to the Sleepy Hollow pharmacy. Maybe some kind of portable enclosure could be set up around the seating area just outside of the Pharmacy area. I would greatly appreciate your consideration of this matter. I wish there was a negative star option. The past 3 days I have been dealing with my severely depressed suicidal 16 year old in the hospital, therapist intakes, phone calls, just trying to get everything done to make sure that my daughter is safe. I have been told at every appointment, the doctors, nurses, therapist, customer service reps.... everyone that I have spoken to has told me to get an online account set up for her. So I have been trying to set up an appointment with a primary care and I called the customer service representative who was very nice and polite and did get an appointment set up for my daughter to get started on anti anxiety and anti depressesnts and also said that I needed to get an account set up for Evelyn. I told her that I have tried to and have been unsuccessful, I was they told that since my ex husband is the Kaiser member and that I am not a Kaiser member (THANK GOD!!) that I would need to speak to the technical team about getting an account set up since her father is the member. I was then given the number 800 556 7677 for technical support and then transferred to them. A man named Raul answered and informed me that Evelyn would have to be present for me to set up the account and so I said that I will just call back and have Evelyn on the phone and then he said something about the account being set up and I told him that I had set up my daughters account but I was told that the system could not verify the address so I needed that corrected. At that point I was told very sternly that I cannot set up her account. which made me extremely upset considering that I had already said that I would call back with my daughter. I asked to speak to his supervisor but Raul just kept talking over me. Finally when he took a breath he could hear my say that I wanted to speak with his supervisor. I informed him that I have a very mentally ill child who is suicidal and I do not appreciate being told that I CANNOT set up her account. There was no apology, no compassion. I was just told that since its the weekend it will take a little longer to get a supervisor on the phone. I said I would hold. and he just kept talking... I didn't want to speak with him anymore. I just wanted his supervisor. So after holding for a pretty short hold. A woman named Tara came on the phone and I explained to her that Raul should not be speaking to people in that tone because he has no idea what they are dealing with at that point in their lives with their children or in their family. I was calling for my child who is having a severe mental breakdown and to be spoken to like that was unacceptable. I was told by Tara that she is sorry I felt that way! Sorry I felt that way! I feel that any parent who has had the last 4 days that I have had would feel that way and would be a little on edge and deserve a little compassion and customer service due to them from a company that advertises that is some of their main goals! I call BS when you have employees working for you like that! Years ago I was treated crappy like this when I was a Kaiser member and this is the main reason why I will never be one again and why I tell everyone that I know how awful your company is... I was not given a sincere apology ever! I told Tara I had no problem having my daughter with me to call but I would not be told as a 40 year old woman and a mother of 3 that I CANNOT set up the account. Not being able to set up the account was never my issue!!! The way I was spoken to was my issue. I told Tara that I would love to speak with her supervisor and their supervisor just so they could know how their employees are treating people. I am sure that I will never have any resolution to this because that is what is expected from a company like yours. Just brush it under the rug. No big deal, its just one upset woman. Well, I hope that this time it can be different that maybe I can get a sincere apology about being spoken to like that. A lack of information for the patient on c difficill. I was recently told that all antibiotics can give a person c diff. Just two years ago certain antibiotics were labelled the cause. Now all are mentioned to be a possible or are unsafe. I suppose this protects everyone but the patient. Its a horrible surprise to develop c. diff and even a harder coarse to get it identified and have medical staff acknowledge it or even know anything about it. It is just ignored and everyone is ignorant and non helpful....again to protect whom and to help who,. And then when a patient i has a future problem they are given tests that are unnecessary to have and not given specific tests to keep the antibiotic to a specific type and not broad spectrum. I have been with kaiser for quite a while. Its the doctor that cares or doesnt.l Its Kaiser who sets standard that requests the patients unrequred tests or multiple test for multiple doctors....no explanation required. Bronchitis is a virus....no blood work or xray is really necessary...breathing treatment, sputum test.... which is not given just antibiotics. There should be more care on antibiotics to prevent c difficill. More information to help the patient who develops c. diff. and more care in future treatment of a c diff patient in the future. Kaiser Permanente started for the people...it had a heart. Now its a business with a cold heart, Not really carring ecept for the bottom line....who works here....whom are responsible for the quality of the product....the good feeling of its participants and the integrity of all concerned. 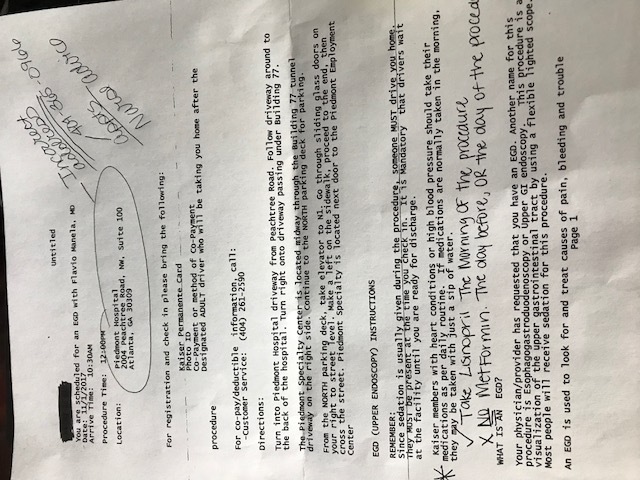 Form letters have incorrect address for Piedmont Hospital. After 3 phones calls to different areas and departments, Kaiser staff instructed me to call your practices and have the issue corrected. My hope is that someone from the corporate office can manage this process with your practices. The form letter provides directions to what used to be the Kaiser office on the Piedmont campus which has not existed for several months. Additionally, the address for any EDG procedure at Piedmont should reflect 1968 Peachtree Road NW, Atlanta, GA 30309, 77 Building, 1st Floor. PDF files are not acceptable to be uploaded? This information is also not disclosed and is a source of rework for those wishing to submit a document along with a complaint. Ordered new lenses on Mon, 2/8/16. Picked them up late Fri, 2/19/16 from Vision Essentials (VE) at the Kaiser Permanente Clairemont Mesa facility in San Diego, CA. Put them on & said "whoa!" The female helping me asked what was wrong. I said I guess I had to get use to them because they were a different Rx. After errands & on way home, noticed stop/street signs were very blurry & out-of-focus, traffic lights had haze around them, had dull, noticeable ache across my forehead. I was nauseous throughout weekend. The sickening headache continued off & on. Knew it was the glasses. Alternated taking them off & on throughout each day. In mornings, had no headache/nausea. Shortly after putting on glasses, symptoms returned. Called VE Mon, 2/22/16 with complaint. Returned to their office that day & talked to young blonde lady who I had spoken to on phone. She wondered if I was able to hit the "sweet spot" because I have progressives. Said lenses had to be redone & would be ready in about 2 wks. I replied that I know I don't look my age and that I had been wearing glasses since the 3rd grade and progressives for over 20 years so I was pretty certain that I knew where the "sweet spot" was and that none of this was acceptable when I had done nothing wrong--they had my $153 & I was having physical discomfort daily. She said my lenses could be ready in less than two weeks and that she knew of one person whose glasses were here in one day; although she doubted that would happen with mine. She said mine could be here in a week possibly. She said that's why they have the guarantee so the customer can feel confident and assured. I complimented her on her wonderful customer service efforts but again asked to speak to someone above her because she had done all she could do in her position. Talked to Baeta (a supvsr). She said the bifocal part was on the extreme corners rather than across the lenses & that they would be ready in about 2 weeks. I explained all the above, that I had done absolutely nothing wrong & if my last name were Clinton, Bush, Spanos or if my face were easily recognizable from tv, we would not be having this conversation. Her actions were not courteous. She stared at me while explaining it would be difficult to pinpoint a specific pair of glasses as it goes through their system. I suggested she use the phone to call, or e-mail/text or send a fax or go to a manager for assistance because I had headaches, was nauseous & needed my glasses within the next few days. I said I'd even be willing to wait until Friday because nothing about this was my fault and that it was incredible that she expected me to be the one with the problem when you have my money and I have no glasses. She said they might be here in about a week. I said I needed them this week because they have my money and none of this is due to my negligence. It ended with her saying that she would call me Wed. to let me know the progress. She called Wed, 2/24/16, said the lenses had to dry from the coating they put on it and would not be ready on Thursday but they might on Friday because the coating would be finished. She said she would call me on Fri, 2/26 and could meet me somewhere near my home so I wouldn't have to come down to their offices. I told her that wouldn't be a problem for me to return to the office. She repeated her offer again. She suggested she could meet me in front of a store to give me my glasses. I said it wouldn't be a problem for me to go to the office. I called her on Fri, 2/26 at 4:23pm and asked why didn't she call me as she had said. She was very stoic and somewhat short in her responses. She said she was checking on my glasses and that they were still going through the coating and the process. I asked if it was another coating. She said yes. I asked why didn't she bother to share all this with me when she talked to me on Wed. She totally disregarded my question and said my glasses would not be ready today (Fri) and would contact me when they were ready and she hung up. I feel her demeanor and conduct very unprofessional and disrespectful to me as a consumer and customer and member of Kaiser Permanente. I was not remotely responsible for their glaring inaccuracies as regards my lenses. I don't know if they have any checks and balances or quality control so this easily catchable defect can be prevented. I am beyond annoyed with headaches and nausea on top of paying my money and getting nothing but rudeness and silent seething from Baeta. Additionally, I don't think it very professional to tell me that you'll meet me anywhere I want near my house (I’m sure it was because she didn’t want me to come into the office). Suppose the lenses still aren't correct? I don’t feel she treated me with any dignity or respect. And...she didn't even bother to check the particulars of my file or she would have known that my lenses have to be changed out and it would be better that I come into the office. I feel she was very abusive of her supervisory position. Why would she demean me by thinking that it’s ok or that I want to do a "street" transaction? That is so disrespectful and undeserving. I would be highly surprised if she has not exhibited this surly attitude towards other Kaiser members because she presented it to me very easily and effortlessly. I would like her manager and their department and those in the higher positions in Kaiser's Corporate Offices to know the kind of treatment afforded to their members by one of their Vision Essentials supervisors and to make whatever changes necessary so we, customers, are all treated with the courtesy and respect deserving of members who have paid Vision Essentials for a service. It's imperative if you wear glasses....that you be able to see and read. Called Kaiser customer service number at 404-365-0966 and no one answered. Called back to 1-800 number and put on hold for 10 min no answer. Then I called corp office transfer to ga after waiting 10 min try to arrange for lab work put on hold 5 min. Then they told me advise nurse would be on line, so I waited for 10 min but no advise nurse. I left my phone number, this is a lousy way to do business and I will be shopping around for better service. Life is to be planned well and specially your healthcare matters when you plan and decide to go with the right Insurance company like Kaiser Permanente. My father has frequent cardiac pain and I really want to give him the best treatment which is suitable to my budget, my father can enjoy the faster relief and i got the right choice with Kaiser Permanente. I am glad to suggest you all to ring up Kaiser Permanente for affordable health coverage plans which is available online for Individuals, Corporates, Employers. Manage your account online and get the benefits instantly with Kaiser Permanente. Have feedback for Kaiser Permanente?